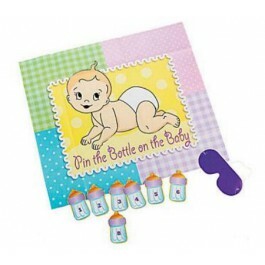 Get your guests out of their seats and mingling with our Pin The Bottle On The Baby game! 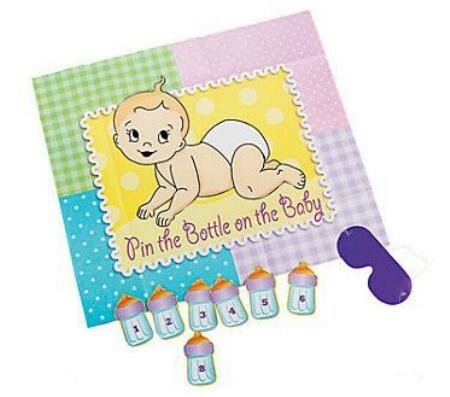 Pin The Bottle On The Baby Game. Get your guests out of their seats and mingling with our Pin The Bottle On The Baby”game! Take turns trying to pin the baby bottle near the baby’s mouth while wearing a blindfold. Don’t forget to spin the player around three times! The player who pins the bottle the closest to the target wins! Includes a 30" x 22" paper baby, twelve numbered baby bottles and one cardboard blindfold with an elastic strap.